"pioneer," "the leader," or "the one who shows the way." Never has there been a name more apt than his. In the 1980s there were no elephants left in the northwestern stretch of Namibia's Kunene region due to over-hunting and rampant poaching. Then in 1989, Voortrekker visited the area, scouting around for a couple of weeks, patiently assessing every possible location, looking for danger, protection, hide-aways, watering holes and secret juicy food supplies. A few weeks later Voortrekker returned, bringing his family to the Ugab River area. The small group of elephants must have been surprised at their leader's actions, but trusted him implicitly, as his instincts always had turned out right before. The family unit, consisting of only about 20 individual elephants, had moved in. The Damaraland Desert was now their home and they had to survive. Voortrekker taught them how to dig wells with their trunks and which shrubs contained the softest, moist foods. He showed them how to store water in a poach in their throats to use a couple of hours later, when they weren't near the watering holes anymore. He led them straight to the fragrant Commiphora plants for a special treat. The original group of 20 elephants split into three distinct family units, each favoring specific areas of the Desert for themselves. Over the years they travelled many miles, their feet developing wider than those of other elephants. They became skinnier than normal elephants, and they started nursing their babies for twice as long to adapt to the harsh conditions. In 2008, the Namibian government decided to issue permits to hunts these elephants. Six permits were issued, one for Voortrekker. An urgent appeal was launched with the help of Desert Elephant Conservation in order to stop the hunt, but five elephants still got killed. A group of 10 dedicated women took up Voortrekker's cause, and walked 140 kilometers (about 87 miles) through the desert in order to raise the funds needed to buy the bull elephant's permit. His hunting tag was successfully purchased from the Government for a total of $12,000 USD, as a live trophy. The other five elephants had lost their lives, but Voortrekker was now a living legend. 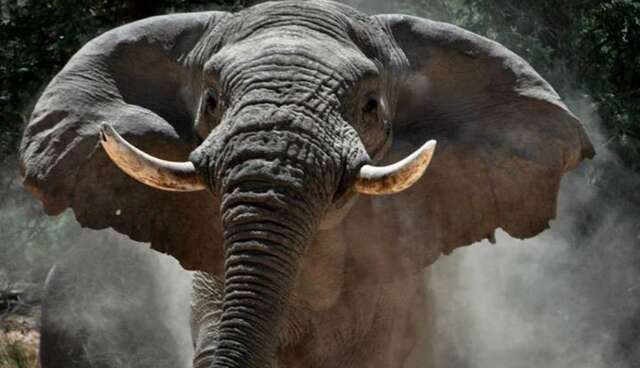 An elephant like Voortrekker, as a living icon, deserves to have the same legendary status as Satao and Mountain Bull, and any of the others that we sadly are so frequently mourning for these days. Voortrekker has a personality all of his own, and with his infinite and ancient knowledge, his wisdom has helped to bring the Namib Desert elephants to the current population numbers; if left alone, they will survive and prosper. He is stocky, and strong, often photographed with his trunk hanging over one tusk. This magnificent pioneer is mischievous, but never viciously destructive. In dreams he still visits the humans who care for him and protected him all those years ago, like a phantom in the night, with a silent whisper of thank you echoing through the quiet desert night. The saddest part of this story is that should the Namibian Ministry of Environmentalism and Tourism continue with the hunting permits, it is quite possible that Voortrekker can be killed under one of those permits, even though his life was bought and paid for.